When the Left begins a lie, they follow through. And on the heels of one of the most anti-Americans winning “Citizen of the Year” by GQ magazine, why shouldn’t Time give Kaepernick the Muhammad Ali Legacy award? Time Inc.’s SPORTS ILLUSTRATED today announced that quarterback Colin Kaepernick will receive the Sports Illustrated Muhammad Ali Legacy Award. The honor will be presented at SI’s Sportsperson of the Year Awards show on December 5 at Barclays Center in New York, and it will be televised nationally for the first time, airing on NBCSN at 8 p.m. ET on December 8 and on Univision Deportes Network at 8 p.m. ET on December 9. The Sports Illustrated Muhammad Ali Legacy Award goes each year to an athlete or sports figure who embodies the ideals of sportsmanship, leadership and philanthropy and uses sports as a platform to change the world. SPORTS ILLUSTRATED will feature Kaepernick’s charitable efforts in its upcoming Sportsperson of the Year issue. The award just shows how watered down such awards have become. Because, if Kaepernick embodies the ideals this award is said to represent, then toss this baby in the trash. His antics have cost his league hundreds of millions of dollars. Moreover, this translates into far less money going to NFL Charity, the philanthropic arm of the league. So the net is a loss for charity. Next, Kaepernick’s protest was built on a lie. And Kaepernick is supposed to represent the legacy of Ali? How distorted is Time magazine? When Ali protested the draft, he fought the idea of serving a racist Democrat regime who would dare treat black men like animals, then send them to war as fodder. 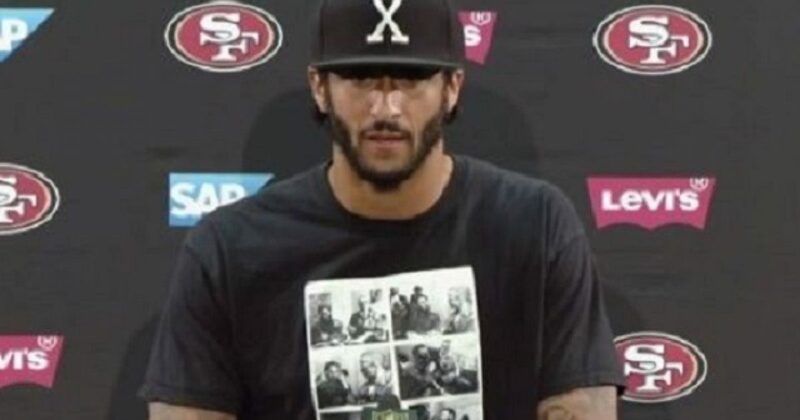 Kaepernick doesn’t remotely know what that is about. Kaepernick certainly hasn’t earned this award on the field. But what about off the field? Kaepernick, who led the San Francisco 49ers to the Super Bowl in 2013, has also excelled off the field as an advocate for change in communities and as an inspiration to a new generation of civic-minded athletes and citizens. Over the past year he has donated $1 million to dozens of local charities from Oakland to New York City. Hmm, and what charities has Kaepernick donated to? As TBS noted not long ago, Kaepernick donates to terrorists. As if things can’t get any worse for Colin Kaepernick, he piles on himself. In another self-inflicted move to apologize for the loving white people who adopted him, Kaepernick rebels. This time the moron decided to make a further statement against the police. And he let his money do the talking. Kaepernick’s foundation made the donation to Chicago-based Assata’s Daughters, named after former Black Liberation Army member Assata Shakur, in April as part of a $1 million charitable pledge. The Sports Illustrated Legacy Award was born in 2008, when Eunice Kennedy Shriver, founder and driving force behind the Special Olympics, was the inaugural honoree. In 2014, Earvin (Magic) Johnson was honored for his two decades as an entrepreneur, philanthropist and social and political activist. In 2015, SI renamed the award in honor of Muhammad Ali in recognition of his decades as a boxing legend, humanitarian, civil rights activist and icon. The inaugural rededicated award was presented to Jack Nicklaus. Last year’s co-recipients were Kareem Abdul-Jabbar, Jim Brown and Bill Russell. Kaepernick’s body of work and philanthropy don’t come close to any of these previous honorees. But the good news is, as we’ve learned of the Left, they giveth awards, and they taketh away. Just ask Bill Cosby. Or Charlie Rose.